A new Nielsen study finds plant-based product sales are growing across all categories. Get the numbers and learn about two standout categories below. If you need even more proof that plant-based eating is here to stay, a new study conducted by Nielsen and commissioned by the Plant Based Foods Association found that sales of plant-based foods grew by an incredible 20 percent in the 52 weeks ending June 16, 2018, reaching a total of $3.3 billion. With total food sales growing at just 2 percent, the data depicts a picture in which plant-based products are no longer just a niche market. 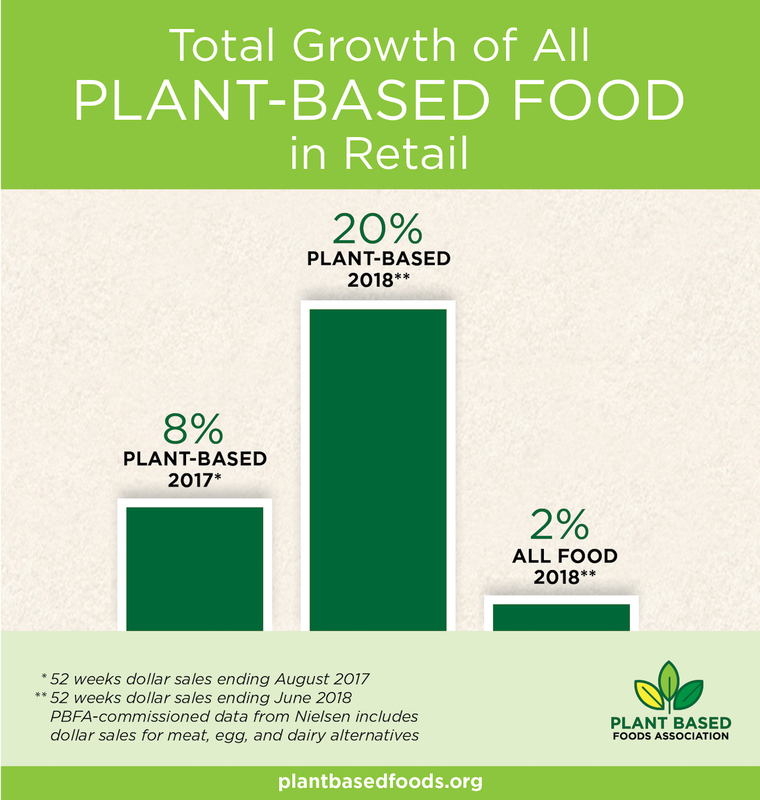 “The new data confirm what we are hearing and seeing every day from our members: sales are up, investment is increasing and new jobs are being created in the plant-based foods industry,” Michele Simon, executive director of the Plant Based Foods Association, said in a statement. Nondairy milk continues to be a leading category, representing $1.6 billion at 9 percent growth—up 3 percent from the previous year. The meat alternative category, which excludes tofu and tempeh, grew an impressive 24 percent to $670 million—good news for the slew of high-profile food-tech brands such as Beyond Meat and Impossible Burger that are attempting to cull customers who want to experiment with plant-based eating but who aren’t necessarily vegan. Nielsen reports that animal meat sales grew just 2 percent in the 52 weeks ending June 2018. Why the rise in plant-based sales? According to Jaime Athos, president and CEO of the legacy plant-based alternative company Tofurky, while readily accessible access to information about the health, environmental and moral downfalls of eating meat has contributed to more people experimenting with plant-based eating, it is the sheer existence of high-quality alternatives that pushes the category forward.